It’s almost as recognizably Toronto as the CN Tower, and found on virtually every street corner downtown. 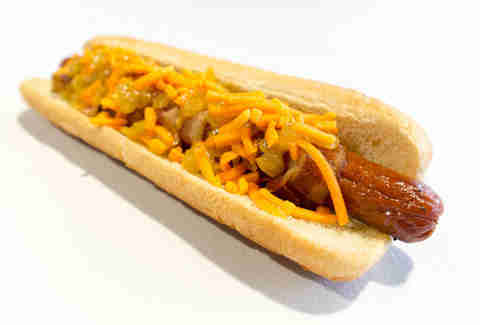 It is the noble hot dog. And for the most part, the popularity of these guys has been driven -- let’s be honest -- by the fact that the curbside vendors are the only guaranteed thing open in the post-bar, standards-dropping small hours. But recently, some Torontonians have taken it upon themselves to give meat in a tube a good name, to strive to be crowned Sausage King (no, seriously. Each summer, Marben Restaurant pits the city’s hottest chefs in a bracket-style tournament that’s aptly named the Sausage League), and to create a gourmet frank. Here are those wieners. Wvrst’s unpretentious mix-and-match menu gives you the choice to stuff a toasted airy white bun with everything from traditional bratwursts to fancy kangaroo, pheasant, or elk varieties, and toppings like sautéed onions and sweet peppers. 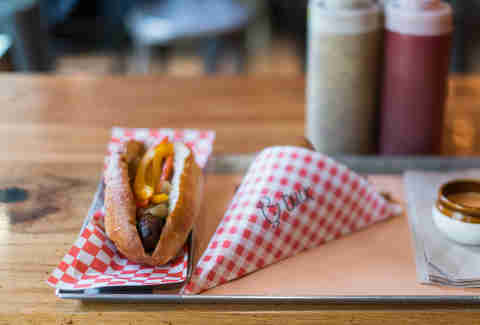 You however, want their weiner-de-resistance: the very Canadian bison-blueberry-maple sausage, and you want to pair it with a pint (this is a beer hall, you know) and a side of Belgian-style duck fat fries. Note: a tomato-y currywurst upgrade is also available, but not recommended with the game sausages. Trust. 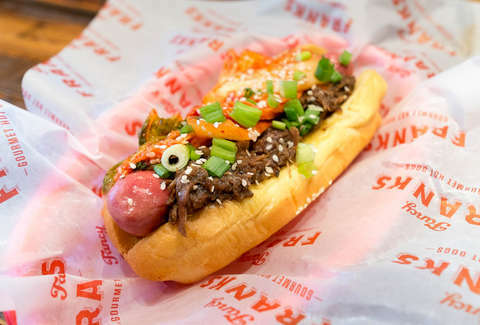 This year-old gourmet hot dog shop serves a host of non-traditional toppings over plump all-beef shoulder franks. Pick from PB&J, Korean beef ribs and kimchi (Franks got Seoul), or even mashed potatoes, smashed peas, and gravy (Fancy Britt). 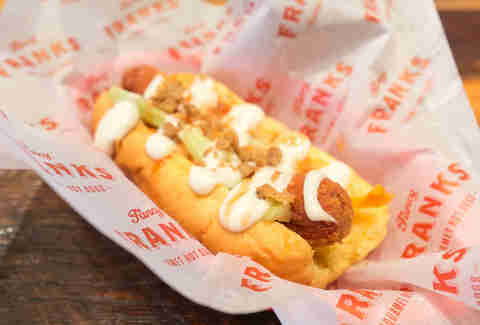 But the winner is the Frankie Goes to Buffalo (fried panko-breaded wiener, w/ blue cheese dressing, Buffalo wing sauce, chicken bacon, slivered carrots, and celery), a frank that taste exactly like a 6in boneless chicken wing. On a bun. Yeah. 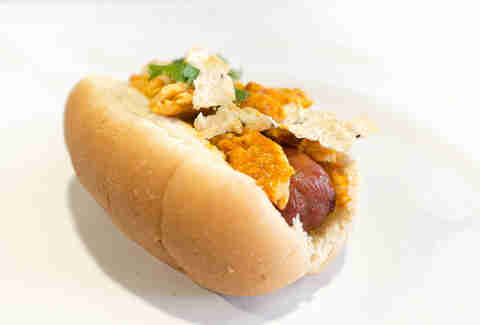 It’s a riff on the Japadog -- a Japanese-style hot dog that originated in Vancouver -- that’s a mash up of the humble dog and the hottest condiment of the year: kimchi. 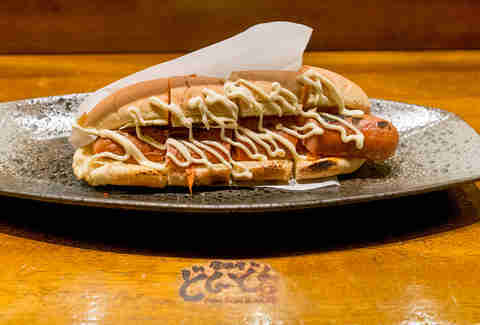 DonDon’s version takes a creamy and slightly tart slaw (made from a blend of shredded carrots, crisp napa cabbage, and chili that gives it a Sriracha-like kick) and sandwiches it between a grilled soft bun and a half-grilled wiener that’s generously drizzled with Kewpie mayo. Then it’s cut into four portions that you can eat with chopsticks. The only resemblance it has to the ballpark staple is the paper sleeve it’s served in. Quite frankly (!) the only thing you really need to know about this beast is the name. Foot-long bacon-wrapped hotdog. Further, superfluous details include the fact that it has mustard, sautéed onions, cheddar cheese, and a basket of house-cut fries. Sports fans have one more thing to root for when they head to the ACC or BMO Field for a game. That’s right, you can now get a Nathan’s wiener topped w/ gravy-slicked butter chicken. The meat-on-meat combo is broken by airy crisp papadum wafers and fresh cilantro, which tastes surprisingly good. This traditional snack bar’s, and maybe even the city’s, favorite dog is probably this simple steamed number (hence the name). It’s cheap, juicy, and made with pork, beef, and chicken. 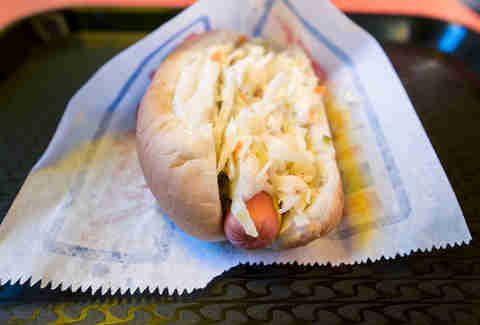 Go for the all-dressed version, where the 5in Lester dog is served under a blanket of coleslaw, mustard, and onions. It may not be all fancy, but it's as close to perfect as you can get. Being named Sausage League champion is a typical middle school insult sure indication that Chef Jesse Vallins is doing something super-right. His playful spin on the Reuben sando is a case in point -- he takes everything that’s found in a Reuben (corned brisket, sauerkraut, rye bread crumbs, Swiss cheese, and beef suet) and stuffs them in tube form, then artfully plates the cooked sausage w/ everything that goes with a Reuben (maple mustard, sauerkraut-like onions choucroute, a huge dollop of Russian dressing-crème fraiche that’s studded with Kosher pickles, and more rye bread crumbs).